Palms Resort has indoor and outdoor pools and whirlpools, an indoor kiddie pool, exercise room, and more! Enjoy year-round swimming in our spacious indoor pool and our soothing indoor whirlpools. The little ones can splash their way through their very own indoor pool as well. And nothing beats the refreshing, clear waters of our oceanfront pool. As if that weren't enough, our guests can also enjoy (for a nominal fee) the 18,000 square foot indoor recreation center at our sister property located at 9th Avenue South. 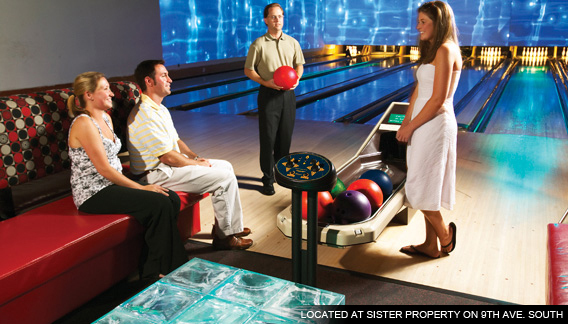 This action-packed amenity is fun for the whole family and features 20 AMF bowling lanes, video arcade with the latest video arcade games, and much, much more!